Joe Bonamassa performs onstage during Keeping the Blues Alive at Sea V. The floating festival, presented by Sixthman, sailed from Tampa, Florida, to Grand Cayman from Feb. 25 - March 1, 2019. Every day it seems as if a new lineup of artists is announced to play some larger-than-life music festival, offering up a “unique” experience to concertgoers. Certain events focus on genre (you’ve got your Stagecoach and Rocklahoma types), while others (such as Coachella) offer an eclectic mix of popular acts. You’ve got festivals with featured holograms, events that cater to specific subcultures; we even just saw the phenomenon of the notorious Fyre Festival, which led to a massive failure that quickly spiraled from a promised “luxury” island adventure into an absolute disaster. These days, there are so many options that you can expect to find something for everyone. As festival season rolls around again this year, many fans await the return of their favorites, while others anticipate news of something different that vows to usher in a brand new one-of-a-kind experience. Since 2001, there has been one company at the forefront of the entire movement, bringing together bands, brands, and fans for an unparalleled treat - a floating festival. Sixthman, who champions slogans such as “live loud” and “moments that make life rock,” curates vacations at sea, sculpted around today’s top entertainers. In addition to music, comedy, and sports events, Sixthman offers cruisers a sense of community, which, let’s face it, is one of the most important factors of a quality festival. Once aboard, you’re officially greeted with a high five (there’s even a running tally), they welcome you with games, lead you to discover new talent, and invite you to take part in opportunities that allow you to interact with the artists you love. On top of intimate performances and multiple shows spread out over several stages, there’s also the obvious draw of the dream vacation; which is all a part of the package. Ports inside the United States include New Orleans, Miami, and Tampa. There, you’ll board the ship and set sail for exotic locations such as the Virgin Islands, Belize, Honduras, Mexico, and The Bahamas. While you enjoy the ethereal atmosphere, you get to see your favorite acts take the stage. You can mingle with artists, as well as other vacationers who are there on holiday, or, as some do, use the occasion for a reunion with loved ones who live in other parts of the world. Sixthman adventures include the 311 Cruise, the KISS Kruise, the Impractical Jokers Cruise, the Chris Jericho Cruise, and Kid Rock's Chillin' Most Flyin’ High Island Jam, along with so many others. Imagine running away to a Caribbean paradise with Jon Bon Jovi, sailing across the sun with Train, or keeping the blues alive at sea with Joe Bonamassa. Both the Norwegian Pearl and Norwegian Jade make for the perfect environment. You can play in your ship’s casino, opt for the buffet, pamper yourself in the spa, utilize the fitness center, indulge in international fine dining options, and enjoy its many bars and lounges. Into 2019, as Sixthman continues to grow, we’ve recently seen them expand into new territory. 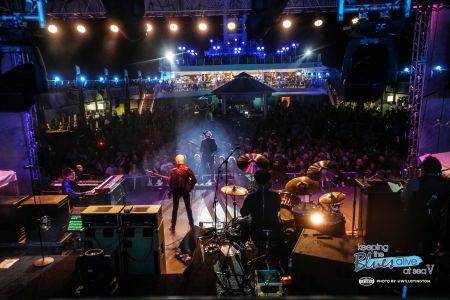 Along with Bonamassa’s upcoming installment of Keeping the Blues Alive at Sea (VI), they’ve added a Mediterranean version of the floating festival; which will welcome returning talent such as Kenny Wayne Shepherd and Larkin Poe, as well as the inclusion of Peter Frampton. New high seas adventures will incorporate stops in Europe such as Barcelona, Monte Carlo, and Malta, as well as all-inclusive resorts in the Dominican Republic. To top it off, the team at Sixthman is as friendly a crew you could ever hope for. With titles such as “Ninja” or “Warrior,” it’s no wonder these floating festival pioneers are gloriously riding the wave of ingenuity into the future. For additional information and upcoming events, visit Sixthman.net.